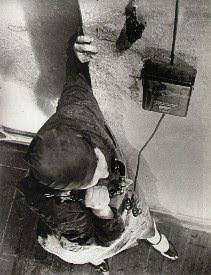 At the telephone is a gelatin silver print by Alexander Rodchenko. The polymath Alexander Rodchenko (1891-1956) is a discipline of Tatlin ad Malevich, may be the most representative figure of those who began in the avant-garde movement in Russia and adapted to the demands of the Soviet Union. This black and white art work shows the portrait of a woman on the phone from a bird's view. The artist is also a master in photography , visual arts, typography, film and stage design.